Equipment packages for every need & budget! 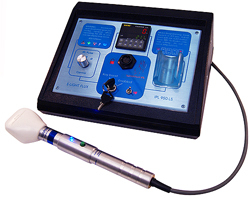 IPL750-LS New Model, Professional Intense Pulsed E-Light System. IPL with High Frequency Assist (35 Watt QCW HF). One of the most impressive desktop IPL systems on the market delivering 50.4 Joules per pulse, 300 Jcm2/second. IPL Laser QCW Diode Emitter is guaranteed for over 250,000 pulses (replacements are $49.95 each). A 15mm spot size makes the IPL750-LS highly versatile and efficient. Designed and engineered for rigorous daily salon use. Also approved for personal or home use. This is and professional-grade machine. 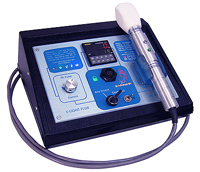 IPL850-LS Professional Intense Pulsed E-Light System. IPL with High Frequency Assist (35 Watt QCW HF). One of the most impressive desktop IPL systems on the market delivering 50.4 Joules per pulse, 300 Jcm2/second. IPL Laser QCW Diode Emitter is guaranteed for over 250,000 (replacements are $69.95 each). A large 24mm spot size will make easy work of large areas while maintaining versatility on detail areas such as hairline contouring and eyebrow shaping. Designed and engineered for rigorous daily use at a busy salon or medispa. This is an industrial-grade machine which will last many years. IPL950-LS The all new Large Spot Model, Professional Intense Pulsed E-Light System. IPL with High Frequency Assist (35 Watt QCW HF). The most impressive desktop IPL system on the market delivering 50.4 Joules per pulse, 300 Jcm2/second combined with the largest IPL treatment area (9cm2) per pulse available anywhere. 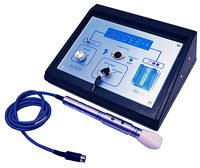 IPL Laser QCW Diode Emitter is guaranteed for over 250,000 pulses (replacements are $89.95 each). An extra large 33mm spot size makes for the highest level of efficiency, especially on legs and full body epilation jobs. Designed and engineered for rigorous daily salon and medispa Use. This is an industrial-grade machine which will last many years providing reliable, consistent results (as well as revenues for the demanding professional).